As the principal advocate for business in the Loveland community, we serve our investors by providing information and advocating on issues that impact your business. Sometimes, despite your best efforts, things just don’t go your way. That’s the unfortunate news that we have to report regarding SB16-210, the Fix Colorado Roads Act, which died in the Colorado House of Representatives State Affairs Committee today, 4 to 5. The bill got caught up in last-minute partisan wrangling over other issues including Democrat proposals to increase taxes on oil and gas producers and reclassifying the hospital provider fee into an enterprise fund. Both were rebuffed or ignored by Republicans. In the quid pro quo world of politics, the other side had to pay. So, a transportation bill that generally had bipartisan support but was promoted by Republicans was doomed. The Act, sponsored by Senate Transportation Committee Chair Randy Baumgardner and House Majority Leader Brian Del Grosso, would have created a robust funding and finance program through the renewal of existing transportation bonds backed by a commitment from the state’s general fund and a small portion of the Colorado Department of Transportation’s (CDOT) budget. The Fix Colorado Roads bond program would have been referred to voters by the Legislature for the November 2016 ballot. The Fix North I-25 Business Alliance worked hard to craft and position the Fix Colorado Roads Act and had gained the support of a number of key business organizations including: the Northern Colorado Legislative Alliance, Colorado Counties, Inc., Colorado Concern, Colorado Business Roundtable, NFIB, Upstate Colorado Economic Development, Weld County, Fort Collins Chamber of Commerce, Glenwood Springs Chamber of Commerce, Colorado-Wyoming Petroleum Marketers Association, Colorado Springs Regional Business Alliance, South Metro Chamber of Commerce, Loveland Chamber of Commerce, Colorado Motor Carriers Association, Colorado Association of Realtors, Vail Valley Partnership, Greeley Chamber of Commerce, Jefferson County Business Lobby, Colorado Contractors Association and the Colorado Association of Commerce and Industry. Legislative inaction flies in the face of public opinion. Polling by the Northern Colorado Legislative Alliance shows that 90 percent of Coloradans believe that the state’s roads and bridges are in dire need of repair, and large majorities want transportation funding to be a priority for the state. Unfortunately, the legislature once again tanked on transportation funding. Construction of a climbing lane on the Berthoud Hill on southbound I-25 south of Loveland will start on May 16 and will be completed this year. Reconstruction of the Crossroads interchange will start this year and will be completed by the end of 2017. 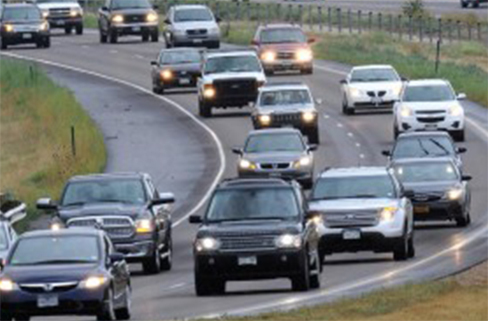 CDOT has teamed up with area communities to propose a $235 million Phase 1 project to widen the interstate between Highway 14 in Fort Collins to just south of 402 on the south side of Loveland. Local communities and landowners have contributed nearly $25 million and CDOT and the North Front Range Metropolitan Planning Organization have applied for a couple of federal grants. A large part of the funding would come from a low-interest loan. We should know the outcome in the fall. The Colorado Contractors Association is considering petitioning a dedicated transportation sales tax onto the fall ballot; we will be watching this closely.